May 20, 2015, 12:07 PM · Imagine playing études, just for fun. 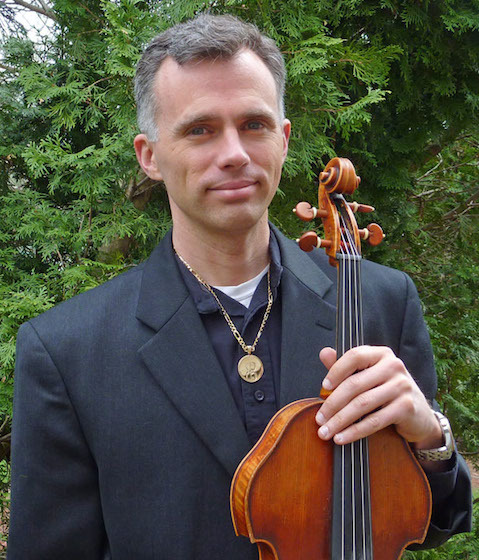 Violist Scott Slapin has found a way to both drill the skills and sneak a little play into this genre of technical study: he has composed a set of 24 Progressive Études for violin or viola that also works as a book of duets. "I see études as a challenge," Slapin said. "Playing violin or viola is not only an art, it's also a sport. Études are a dare: 'Can you do this?' Paganini even dedicated his set to 'the artists.' He was daring other violinists!" Knowing the benefits of études, Slapin wanted to get students motivated to practice them more and prepare them better. "My first thought was to write accompaniments to Wohlfahrt études," said Slapin, who teaches violin and viola privately in western Massachusetts as well as worldwide via Skype, along with his wife Tanya Solomon. "I like and use the Wohlfahrt etudes, but they are often musically boring. That's not because of any deficiency on the composer's part, but they have to be boring because when the student can only play eighth notes in one key, there's not much a composer has to work with there." Then it occurred to Slapin to simply write his own. He set out to write a book of études in which the first half of the book could be played with the second half -- étude No. 1 with 13; 2 with 14, etc. "Midway, the student and teacher would reverse roles," he said. "The idea is at the end of the week the étude might turn into something more musical with the teacher. Also, I've found that when students have to 'perform' at the end of the week, they're a little more diligent." Slapin's 24 Progressive Études start around the level of Wohlfahrt No. 1, then they progress a little more quickly than the Wohlfahrt études. "They're aimed to be more or less a student's first book of etudes; something someone would start maybe in the second or third year," Slapin said. Did Slapin enjoy playing études, when he was a student? "I did! Not at the very beginning, but by somewhere around Kreutzer 6 or so I began to," he said. Études are not all created equal, in terms of being both good exercises and good music. "Études always have a range. Kreutzer No. 13 (in the Urtext 12, the one that starts with the same chord changes as the first Bach Cello Suite) is good enough to perform on a recital. Kreutzer No. 9 (Urtext 8) definitely isn't. Paganini 13 is, 12 isn't. I think it's fun to take the less musical ones, though, and try to make music out of them." "With my own students, after they've covered the entire fingerboard through scales, I like the étude always to be the most difficult thing that they're working on," Slapin said. "They shouldn't struggle so much technically with repertoire, where I'd rather we talk about the music -- phrasing, vibrato, etc. I see the étude as the engine that pulls the train forward, technically speaking." Slapin is an experienced composer; he has written three albums of what he calls "violacentric" recital music: Reflections; All Viola, All the Time; and Violacentrism, the Opera. His viola trio, Capricious, quotes half of the Paganini Caprices and was commissioned by the American Viola Society as a tribute to Slapin's late viola teacher, Emanuel Vardi. "Mr. Vardi and I were the first two to record all 24 Paganini Caprices on viola, he over forty years before I did," Slapin said. "I also made the first recording of the Bach Sonatas and Partitas on viola, which along with the Paganini, I consider the twin-bibles of upper string playing." Nonetheless, Slapin's étude-duets presented a composing challenge. "It was a lot of things to juggle at once. It had to seamlessly line up so that Étude No. 13 was just a little harder than Étude No. 12," Slapin said. "They had to be true etudes, not duos. These each needed to focus on a technical issue." That being the case, they couldn't follow some of the normal conventions for duets, like parts imitating each other. "Still, I like to think they work well enough as duos, and I think there's some music in there that will make the experience more satisfying for the student and teacher." He did make one set sound more étude-ish: "The last set (12 & 24) is just a fun, crazy homage to Wohlfahrt. I thought that in a book of twenty-four études, at least something should sound like an étude!" Here, Scott Slapin and Tanya Solomon play Slapin Études Nos. 1-3 and 13-15 on viola, as duets. May 21, 2015 at 09:51 AM · Very cool idea! I like it! May 21, 2015 at 02:23 PM · It's a cool idea, but I'm not sure it's truly novel. I remember playing duets out of Whistler books when I was a kid, the second-violin parts (intended for the teacher to play) are somewhat more difficult, and my teacher would assign those to me after I had finished playing all the first-violin parts. Still, I think there is definitely room for more of this kind of thing in the literature because it's just really fun for those of us who play the violin and who have a child/spouse/friend who plays too, at about our same level. May 21, 2015 at 08:04 PM · It's certainly possible that someone had the idea first. I think there's a difference with the Whistler though, which might be best described as graduated duos (if I'm thinking of the ones you're referring to). These are meant to function primarily as etudes, concentrating on one or two technical ideas at a time. Only secondarily are they duos, which is why they weren't so easy to come up with. It was more to juggle than writing duos....whose first priority is to be good duos! May 22, 2015 at 09:24 AM · Scott, your Etudes are really beautiful. I would be excited to play them with my teacher. May 22, 2015 at 01:25 PM · These are great. When might they be available?